Do you like Turbo Penguins? Share it with your friends. Enjoy a lot of great entertainment while playing this great game called "Turbocharged Penguins"! 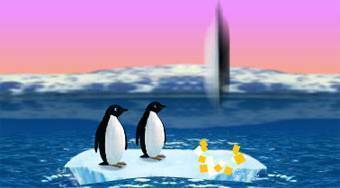 Protagonists of this entertaining game are three likable penguins floating on an ice floe somewhere on the ocean. Choose the penguin you like most and send him on a dangerous journey through the Earth's atmosphere. The best flyers will surely conquer the vertical limit of 2500 meters.